Custom T-shirts for one week only! Just a reminder that from 0900 Mountain Time on July 17th to the same time on July 24th, PARCA will be featured at http://www.float.org. You can get a beautiful custom T-shirt designed to show that you are moved to save rhinos and that our focus is moving them to safety. FLOAT offers various colors, styles, and sizes, all with the graphic you see below. 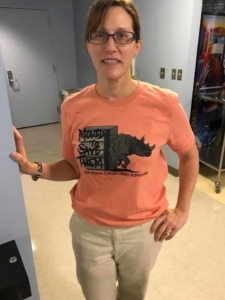 $8 from each T-shirt will be donated to PARCA and we will use every dollar in our support of the joint effort Rhinos Without Borders whose work relocates rhinos from areas of high-poaching to areas of safety. Comments Off on Custom T-shirts for one week only!